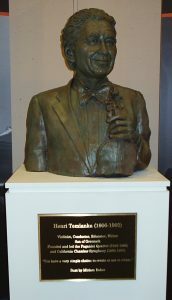 A bronze bust of Henri Temianka was unveiled by his son Daniel in the McLean Museum, Greenock on 18th November 2016. 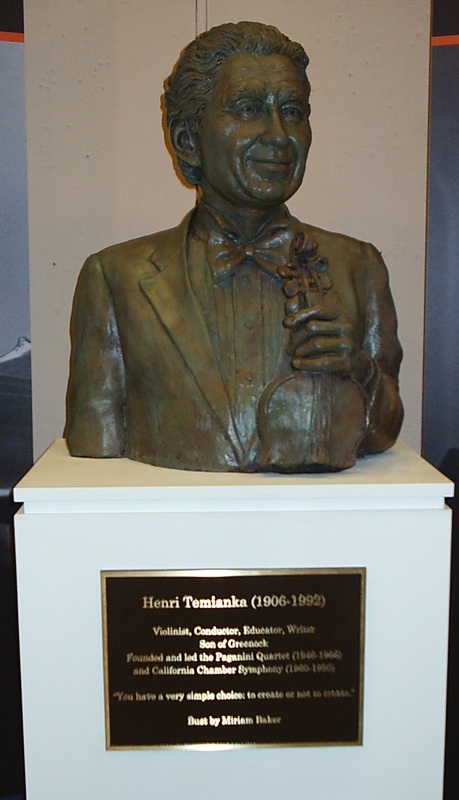 He is almost unknown in the town of his birth and few have realised what an outstanding impact he had in the world of music, as a violin player, as a conductor, as a teacher and encourager, a man who delighted in sharing his music with others. Although he had not lived in Greenock since his early childhood he always regarded himself as Scottish and his family felt it was appropriate that the bust marking his achievements should be given to the town. He was born on 19th November 1906 to Israel and Faiga Temianka at 63 Rue End Street, Greenock. His parents came from Poland and Israel at that time was the minister to the Jewish community who lived in the area. The family later moved to Rotterdam and by that time Henri had been introduced to music by his father who was a gifted singer and musician. He began violin lessons at the age of six and later studied in Berlin, then Paris and graduated in Philadelphia. On returning home to Europe he became a world famous soloist in the music circuit. He made his debut in 1928. Included in the venues was a concert at the London Proms in 1934. He retained his Scottish connection when he was choir master with the Scottish Orchestra 1937 – 1938. When the political situation became very difficult in Germany he moved permanently to America and planned that his parents should join him. However when they were en route through France they were captured and sent to the Gurs Nazi concentration camp. Through the many contacts Henri had made on his concert tours he was able to obtain their release and they joined him in America. He not only played the violin, he founded the Paganini String Quartet, he taught at Universities and held master classes. He also wrote many articles as well as an autobiography called Facing the Music. Thanks to Viki McDonnell for her meticulous research into his life, which you will find in her book Greenock’s Jewish Community 1880 – 1940 and from the booklet published on the day of the unveiling of the bust.